Cash Secured Puts is a simple way to acquire stocks for investment at a lower price than the current Market Price. It involves selling out of the money put options and simultaneously holding enough cash to purchase the stock at lower price. To Explain this strategy lets take reliance as example, where the stock price is currently trading around 921.30. However the investor is expecting correction in the stock price as the market situations are not favorable. Investor is happy to acquire the share if the price comes down to 860 though he/she is not sure about the market correction. In such a situation selling Out of the money put options comes handy to acquire shares at lower price. How to Select the Put Strike? Selling a put obligates you to buy shares of a stock at your chosen short strike if the put option is assigned. For example, let’s say you wanted to buy Reliance, but not at the current price of 921.30. You prefer to pay 860 then one should start writing 860PE strategy. Assume that investor is able to acquire March 860 PE at the premium of Rs7. In that case Rs 7000 got credited into the investor account by selling 860PE march option. If the stock price on expiry is likely above 860 then Investor keeps Rs7,000 regardless of what occurs with Reliance shares. How much cash is require to Execute the Strategy? However the Investor want to acquire reliance when stock price trades below 860. so a minimum of Rs8,60,000/Lot is required to hold in his investing account. Now go to your broker portal and check with the Margin Calculator to compute the Margin Required to Short March 860PE. Margin Required = Rs 1,22,265. Adequate margin is already there as the investor already has Rs8,60,000 in his investing account. Investor also has an obligation to buy Reliance at 860 on March Expiry as he/she is shorting 860 March Put Option. It’s important to remember that even if the stock drops to 800 between now and 28th March, the investor still has to buy Reliance for Rs860/Lot. What if Scenarios on Expiry Date? What if Reliance share trades above 900? On Expiry Date if Reliance trades anywhere above 860 investor will still not be able to buy the stock price at Rs860 but still he collects and keeps the premium of Rs7000. In that case again start writing 860PE April Expiry and repeat the above process to acquire shares around 860. What if Reliance Share drops to 800? On Expiry Date if Reliance trades drops to 800 still has to buy reliance stock price at 8,60,000/Lot. 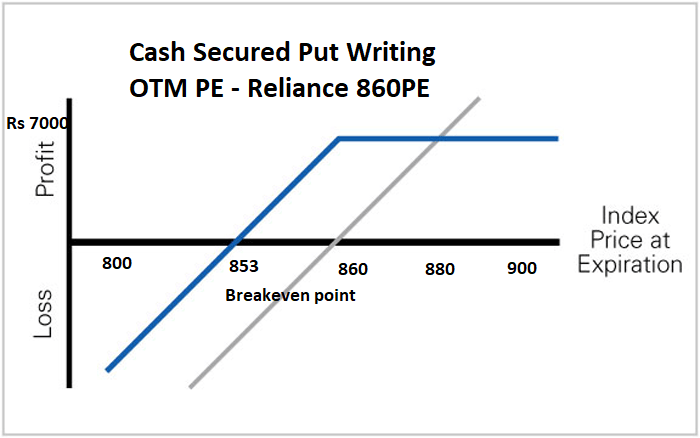 For Example Reliance ends at 800 then March OTM 860 PE will have a premium value of Rs60. so investor lost Rs60,000/Lot but he will be able to purchase the stock at 8,00,000 per lot. Hence his net price of acquiring the stock becomes Rs 8,60,000/Lot. Brokerage ,Transaction Charges and other tax Calculations are not added in the above example. If the stock price doesnt moved lower instead the stock moves higher in that case investor lose the investing opportunity but still end up with the premium of Rs7000 in the above case by selling out-of-money PE options. Greediness & Leverage kills the investor if the investor wants to write more put option than the actual money at stake in his trading account. For Example if the investor writes 5 lots of reliance 860PE instead of 1 lot by holding 8,60,000 in his account balance. Let say stock drops to 800 then it could bring serious loss of 60 x 5 x 1000 = 3,00,000 lakhs in his investing account and also he will left with sufficient margin to buy enough shares at Rs800. Overall if Cash Secured Puts strategy is rightly handled and market moved in investor favor then investor will be able to acquire stocks at lower price than the current market price. If not the market moved in investor favor still he/she earns the income by selling the premium of Out of the money options. well…not sure what prompted this article, but the return on capital is conveniently ignored. caution on leverage is given, but does not address the situation when the stock falls beyond the acquisition price (if the put option strike is breached and the stock is purchased), entire 860,000 is at stake. “Investor also has an obligation to buy Reliance at 860 on March Expiry as he/she is shorting 860 March Put Option. ” in NSE context, this is not true. its all cash settled at expiry. average ticket size of an retail investor is not enough to put tips on this article to practice. for some, their entire portfolio is not worth 8,60,000.
don’t copy paste concepts from western markets. address return on capital? opportunity cost! apologies if i hurt your ego ! Yes it is cash settled. So on Expiry still the Investor has to do some manual punching of orders to get the stock price around 860. This article doesn’t address the small investors problem. In this case, is any algo platform available for placing the order at cost of 8,60,000 ( executing cash and buying back the option that was written earlier simultaneously).